Is An Aussie A Good Fit For Us? My husband is in the Air Force and works about 8-10 hours a day. I work part time from 9-5 three days a week and can make it home for lunch to let a puppy out. We are in the process of adopting an Aussie pup that is 8 weeks and we are just trying to figure out if this is the best situation for us and for the puppy. 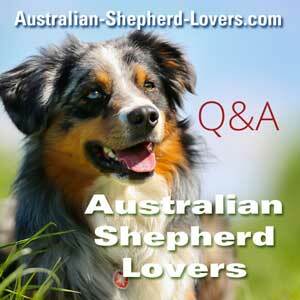 I have previously had Aussie mixes that have been amazing dogs! They have been calm and cuddly but can also be energetic when given the chance. We are planning on crate training while we are at work and will exercise him when we get home (before and after work). We live in an apartment and there is a dog park that we can take him to weekly as well. Any thoughts or encouragement to offer? Comments for Is An Aussie A Good Fit For Us? I have two aussies, and both are very active. They get about two hours of hard exercise, running, chasing frisbee, chasing each other. If they don't get exercise, one of them becomes destructive. You might want to consider a more laid back breed. My Aussie, kevin, who is 8 years old, is my fourth dog is the best dog I've ever owned. He is so predictable. We crate-trained him as a pup. He only uses his crate, now, to lay in for comfort when we're gone. We don't need to close the doors ever. Love ❤️ him to pieces. We do go to the dog park every morning. Aussies were our first two dogs, they are fabulous dogs but need much exercise and attention....there is a reason they are called Velcro dogs. In my opinion, it would be unfair to cage an Aussie for 6-8 hours a day. But, do what feels best for your family. We have had 3 Aussies. They are all energetic dogs. While our last two were crate trained as puppies, we only kept them in during the night and if we were away for short periods of time. Perhaps you should delay getting a puppy until you do not have to be away for long periods. Perhaps an older Aussie would be a better fit for you situation. Aussies need plenty of exercise, do you have a neighbor who can step in and walk them mid day when you are at work?